Those Americans who watched President Barack Obama’s carefully choreographed mid-vacation news conference on August 18 were treated to the announcement of a new “Obama doctrine,” that henceforth it would be the goal of the United States to “contain” the new Islamic State established in parts of Iraq and Syria by the radical Islamist political-military movement ISIS. In using the word “contained” Obama appears to be saying that he is prepared to accept the existence of the Islamic State caliphate, and the ISIS political-military movement that is behind it, in much the same way that the Washington establishment came to accept Soviet communism during the Cold War. “Containment,” as historian Robert Wilde notes, was first outlined in U.S. diplomat George Kennan's 1946 “Long Telegram.” The policy aimed at stopping the spread of Communism and keeping it “contained” at a time when Eastern Europe was under the military, and increasing political, control of the Soviet Union, and when Western European countries appeared to be wobbling from their democracies because of socialist agitation and collapsing economies. Eventually, the doctrine was expanded to cover the world, leading to the Truman Doctrine of supporting non-communist states threatened with Communist revolutions and the U.S. involvement in Korea and Vietnam. But “containment” implicitly accepted the continued existence of the Soviet state and committed the United States to an endless “Cold War,” that grew all too hot for hundreds of Americans who died in various Cold War “incidents” and the more than 133,400 killed, wounded and missing in Korea and the more than 213,000 killed, wounded and missing in Vietnam. Of course it is possible that Obama was being imprecise, as his very light grasp of the history of American foreign policy might lead him to be, but we are inclined to believe that he really was announcing a new policy of accepting the existence of the Islamic caliphate and its new de facto state in what was formerly Syria and Iraq. 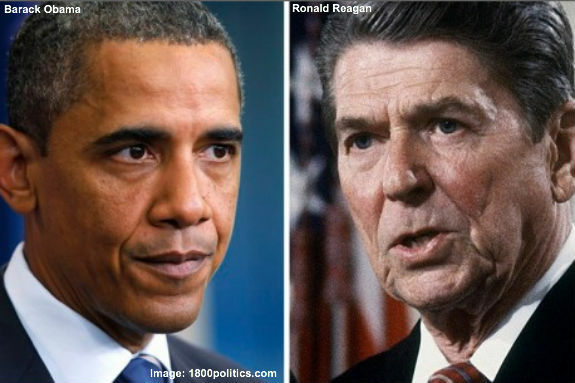 By adopting a policy of “containment” and accepting the continued existence of the Islamic State, Obama stands in stark contrast to Ronald Reagan’s successful approach to defeating the Soviet Union and demolishing world communism as a threat to Western democracy. During the Cold War, the practical result of “containment” was that it became an article of faith among Democrats and establishment Republicans that America must accept the existence of the Soviet Union and simply live with the threat of international Communism and nuclear annihilation. Reagan saw Soviet Communism as existential threat not only to the United States, but to Western civilization. Reagan rejected the idea that Soviet Communism should merely be “contained,” opting instead for a policy of confronting and rolling back the Soviets in every sphere of national power; economic, cultural and in a very carefully calibrated military competition. Reagan understood that to defeat the communist enemies of freedom we had to engage them on every battlefield of national power. That is why he pumped up Radio Liberty and the Voice of America, supported the Solidarity labor movement in Poland, deployed America's technological and industrial prowess in merciless military competition with the Soviets and made liberating the captive people of the Soviet empire the foundation of his foreign policy. We have enemies who want to destroy our way of life because they truly believe that the misogynistic hell that was Afghanistan under the Taliban was the model for a pious society; there are religious leaders who are prepared to kill millions because they have been exposed to our cultural influences; and, finally, Americans must understand that our enemies are seeking chemical, biological and nuclear weapons, and the long-range missiles with which to deliver them, not because they aspire to our material wealth and progress, but to end human progress as we know it. Ronald Reagan understood that in Soviet Communism we faced enemies with whom there could be no compromise, only the victory or defeat of freedom. In the radical Islam of ISIS we face that same choice today. If Obama’s policy of “containment” of the Islamic State prevails, then this past week’s airstrikes are only the first battles in a war that will last, as the Cold War did, until a President with Reagan’s courage stands up and decides that we win and they lose. Submitted by henmirlab on Wed, 08/20/2014 - 20:13. This is a reflection of Obama's mind-set: It describes the limits of what he knows about world affairs. It speaks to the limitless ignorance of one who has been well-schooled in the euphamisms of leftist rhetoric. Since his election in 2008 Obama has consistently shown, in statement and statement, that we US voters made an abysmal mistake in electing such a thoroughly un-vetted personality to this highest office in the land.